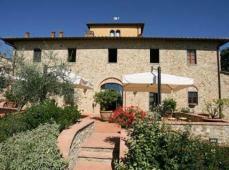 Villa Azzurra is situated in the splendid Tuscan hills of Chianti halfway between Florence and Siena, Italy. The location of the villa is in a strategic position where it is easy to admire the most important Tuscan cities without having to renounce a relaxing and tranquil holiday in the countryside. This century old villa has recently been restored conserving the original structure such as wooden beams, brick arches and terra cotta floors completely following the Tuscan tradition. In thirty minutes you can easily reach cities such as Siena and Florence or if you prefer to enjoying the splendid panorama of the green Tuscan hills you can reach the Medieval town of Monteriggioni, famous for its splendid castle, or also the city of San Gimignano. Greve in Chianti, the most famous town in Chianti area is also easy to reach from the villa. For anyone who are interested in shopping, the villa is only a few km distance from the most famous outlets! Villa Description: Villa Azzurra offers accommodation in the main villa and a independent cottage that is nearby. The lower level of the villa consists of the spa area with hot tub, sauna, gym equipment, massage table, two showers, one half bath and doors to the garden. On Ground floor there is the main dining room with fireplace, piano and doors to furnished patio. Main kitchen with stove top, oven, fridge and dishwasher. Reception office and free access to the suite 1. Suite 1: This suite consist of a small living room with fireplace, sofabed for two, TV and private entrance from the outside. Kitchen area equipped with stove top, oven, fridge, dishwasher and washing machine. Double bedroom with a queen size bed, TV and en suite bathroom with tub and shower. One shower room. Free access to the Suite 2. Suite 2: This suite is composed of a large Living/room with fireplace, TV Satellite and doors to furnished patio. The Kitchen is equipped with stove top, oven, microwave, fridge, dishwasher and washing machine. Half bath. From the living room steps up to the first floor with the access to the bedrooms: the first bedroom with a queen size bed and en suite bathroom with one Jacuzzi shower and doors to a furnished terrace, the second bedroom with king size bed and en suite bathroom with Jacuzzi tub and hand shower, the third bedroom with two single and joinable beds and private outdoor bathroom with shower and the fourth bedroom with king size bed. This room is furnished with a unique loft where there is a comfortable sofa bed for two. En suite private bathroom with shower. Free access to suite 3. Suite 3: This suite comprises of living room with lovely fireplace, sofabed and TV. Small kitchen with stove top, oven, fridge, dishwasher and washing machine. Three bedrooms each with a queen size bed , TV and en suite bathroom with shower. Open hallway with steps up to a loft area with a bathroom with shower. Second floor Tower: One bedroom with a queen size bed. This room has no screens. On the first floor there is also a games room with a computer available for our guest with doors to a furnished terrace. Every room have air conditioning, mini-bar, safe, Satellite T.V., telephone, internet access and screens. Cottage: Living/dining room with fireplace, TV and doors to a patio. Kitchen area with stove top, oven, fridge, dishwasher and washing machine. One bedroom with a queen size bed. One bedroom with two single joinable beds. One bathroom with tub and hand shower. Swimming Pool: Of particular beauty the outdoor pool with a large beach entrance and cascading effect on the valley below; still have a large whirlpool entirely covered with mosaic sweet and pleasing waterfalls. The pool fits perfectly into one of the most scenic valley, offering the opportunity for guests to enjoy unique and breathtaking landscapes. Dining: Our Restaurant is available every day exclusively for our guests. it is created to satisfy all your needs. On request it is possible to organise breakfast, lunch and dinner with typical Tuscan Menus and even cooking classes for up to 20 people. Kitchen: A various choice of dishes from appetizers to desserts, all with high quality. Meat and fish are always fresh and only "in-season" vegetables are used to prepare our dishes; all ingredients are carefully selected with attention to give our guests an high quality service. Our menu includes, as first courses, antipasti and a selection of homemade pastas. Main courses include tender Florentine steaks and beef, Tuscan stew with white beans, and rabbit in an olive sauce. Top off you meal with homemade deserts. Wedding: Villa Azzurra is the perfect location for your Tuscan wedding. The villa in its interior can accommodate up to 40 people while outside, thanks to our flowery gardens with beautiful views of the Chianti hills can accommodate up to 150 people. Wedding reception can be organised as you prefer. Your Wedding aperitif can be served in the old barn near the Cellar, the Wedding lunch or Dinner can be served around the swimming pool and the wedding party can be arrange on the panoramic garden close to our spa. Our staff will be happy to help you to make your dream come true taking care and attention to all details. Wine: We are pleased to offer our guests the Wine of our own production, served directly from the grapevines that surround the Villa. Our staff will be delighted to help you select from our cellar the wine the will best adapt to the dishes you ordered. Cooking Classes: Our chef will teach you the Tuscan gastronomic culture with an attentive eye to novelty as well as the recovery of old recipes. The cooking classes are alternated with wine and oil tasting. A pleasant way to learn a great deal about Tuscan life. Spa: We take care of your health and beauty and propose a series of activities and beauty treatments held in our beauty center. We are dedicated to ensuring your physical and psychological well being so as to offer you a relaxing holiday. All treatments are carried out by our highly qualified personnel. Revitalize in our jacuzzi . Enjoy our Gym and relax in our sauna . On request it is possible to organise beauty treatments and massages. While your body is restored thanks to the most modern of beauty treatment your palate will be `delighted by the famous Tuscan cuisine.